MyHeritage.com -- another scam site? Qute a few nenbers of the Growden/Growdon family seem to have made names for themselves on the stage, or in musci, and here’s a news item that mentions another one — Bryony Growdon. Does anyone know where she fits in the family tree? Leander Club has a reputation for producing some of the world’s best rowers and also possesses scenic dining facilities as an inspiring backdrop. On Thursday, July 22 at 7.30pm Leander hosts original music theatre in the form of The Divine Divas. Actresses Yvonne Delahaye, Bryony Growdon and Vicky Poole all possess a professional acting pedigree and were thrown together by fate and bring their experience to the roles of jobbing actresses in Matheson Bayley’s original musical play Lights, Camera, Resting. I’ve found a possible marriage in FreeBMD for Elizabeth Ann Growden (RIN 3976), my great-grandfather’s older sister. They are in the 1871 Census as Kendall, but in the 1881 Census the spelling is Kendle, which appears to be an enumerator’s or transcriber’s mistake. I could find no trace of them in the 1891 census — perhaps they had moved away, or it hasn’t been fully transcribed yet. My great-grandfather, William Matthew Growden (he later used the spelling Growdon, as did all his South African descendants) came to the Cape Colony in about 1876 to build the railway line from East London to the interior. 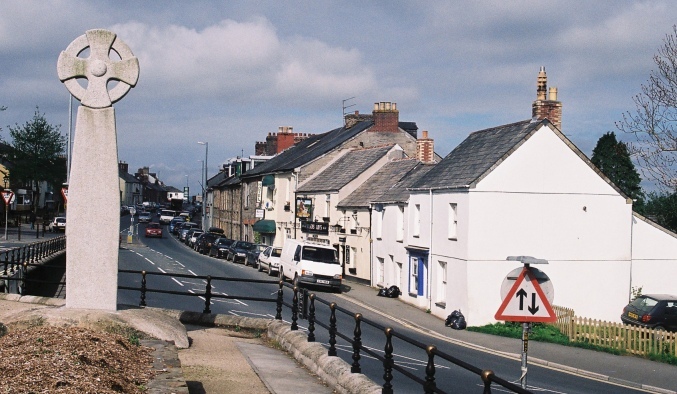 At the time of the 1861 Census he was living at 3 Higher Bore Street, Bodmin, aged 10, with his father Matthew, aged 61, his mother Christiana, aged 51, his step-brother Thomas Pope, aged 23, his sister Elizabeth Ann (12), and brothers Mark (7) and Simeon (5). 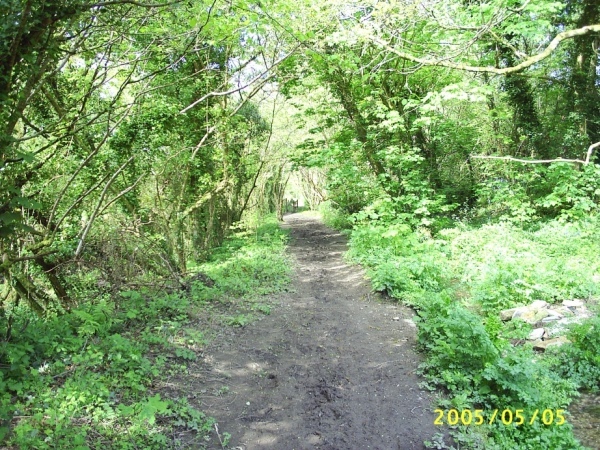 Higher Bore Street, Bodmin, Cornwall (Photo taken 5 May 2005). His brother Simeon died a couple of years later at the age of 8, and Mark died at the age of 28, within a few months of his marriage to Elizabeth Dymond. So I didn’t expect to find any relatives from that generation, so it was quite exciting to find a possible marriage for great-grand aunt Elizabeth Ann, and they appear to have had four children by the 1881 census, so there are possibly more third cousins just waiting to be discovered! Not far from Higher Bore Street is Scarlett’s Well, where the family lived at the 1851 census, and I can imagine the children playing in these leafy lanes after school, or helping their father gather wood (which, as a woodman, was how he earned his living). 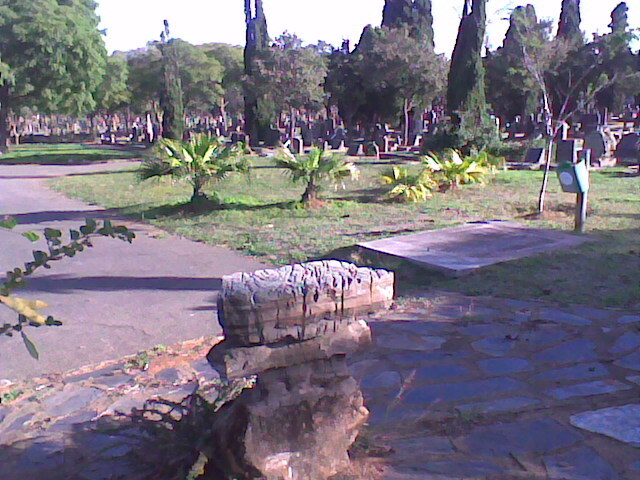 Yesterday I took my son to the Pretoria Showgrounds to write an exam, and while waiting for him I visited the Rebecca Street Cemetery nearby. I didn’t see any tombstones belonging to my family, though I did see one for Loftus Versveld, after whom our city’s biggest football stadium is named. I had sometimes wondered who Loftus Versveld was, and there was the answer — Robert Owen Loftus Versveld, 1862-1932. 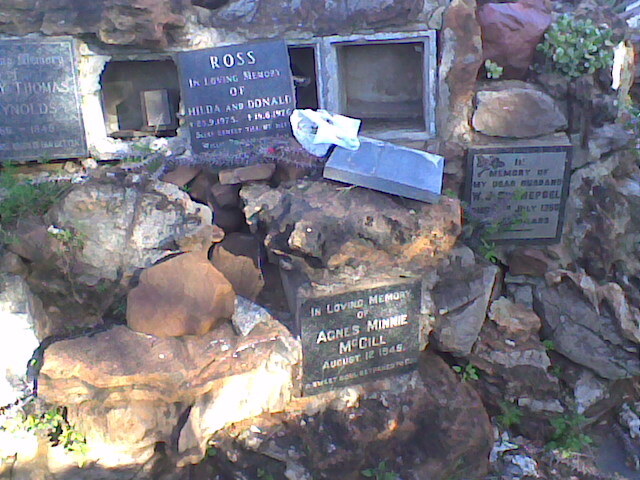 In addition to the tombstone, there was a stone from the Northern Transvaal Rugby Board, acknowledging his services to rugby. And Loftus Versveld Stadium is, of course, a bigger and more prominent memorial, the home of the Blue Bulls, the Northern Transvaal Rugby Team. I wonder what Loftus Versveld would have thought of the World Cup Soccer tournament matches being played there next month. For a long time Loftus Versveld stadium was only used for rugby, and we went to the very first soccer match ever played there, on 12 October 1992, when local team Mamelodi Sundowns played Sheffield Wednesday. Actually that wasn’t the first soccer match, because there was a curtain raiser with a women’s team from Kaiser Chiefs playing against Sundowns, and the Chiefs won easily. So perhaps history was being made in more senses than one — it may have been the first time women had played in the Loftus Versveld stadium. The main match, between Sundowns and Sheffield Wednesday, was a draw. Just before the big match some people paraded around the field with a banner saying “Snor City welcomes soccer”, a reference to the fact that in those days Pretoria civil servants often sported moustaches. I went up to the highest point of the cemetery, on the northern edge, where there was a memorial garden for cremated ashes. There were some modern ones, with memorial stones in neat rows. 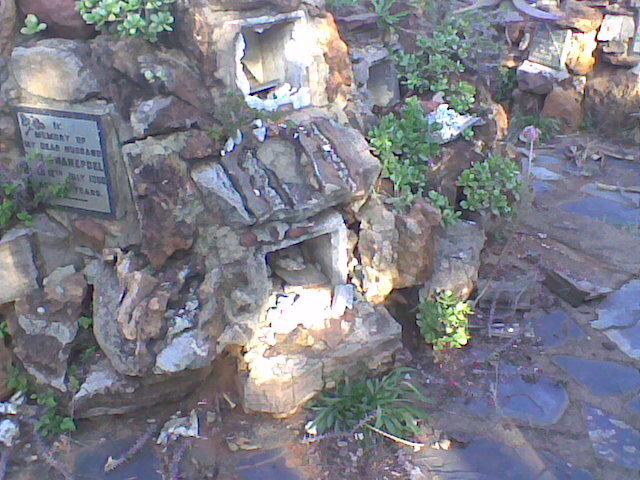 And then there was an older rockery, rather pleasant, except that many of the niches had been broken open, and the ashes stolen. I wondered who would do such a thing, and why. It doesn’t seem to make any sense. What makes cremated ashes valuable to thieves? 1) List your matrilineal line – your mother, her mother, etc. back to the first identifiable mother. Note: this line is how your mitochondrial DNA was passed to you! 2) Tell us if you have had your mitochondrial DNA tested, and if so, which Haplogroup you are in. 3) Post your responses on your own blog post, in Comments to this blog post, or in a Note or status line on Facebook. Neither of us have had our mitochondrial DNA tested. 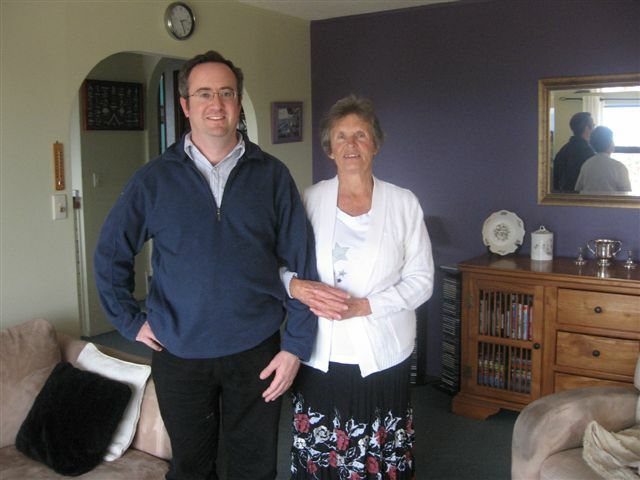 At the beginning of the year Val’s nephew Greg Machin went to New Zealand, and we told him about some of the Green family relatives living there. Yesterday he met some of them, when he went to have lunch with Denton and Ione Evans in Auckland. Greg and Ione are third cousins twice removed, their nearest common ancestors being William John Green (1790-1866) and his wife Margaret Gray (1795-1844). The Green family lived in Quebec, but after Margaret died in about 1843 (we think in Halifax, Nova Scotia, but are not certain) William John Green and the surviving younger children came to the Cape Colony. One of the brothers, Henry Green, married Ida von Lilienstein, and is Ione’s ancestor, while his younger brother Fred Green was Greg’s great great great great grandfather. We did not know anything about Ione until she was put in touch with us by Colleen Tapscott (another descendant of Henry Green) in January 2006. Ione was researching the von Lilienstein family, and sent a great deal of information on her branch of the family, descended from Henry Green’s daughter Edith Susanna Green who married Ernest Borwick and went to Kenya, which was why we had not been able to find them. Greg went to New Zealand to be closer to his daughter Abby, who went there with her mother Sharon and Sharon’s husband about 18 months ago. He works in computer networking, and is hoping to find a job in New Zealand. Ione was born and grew up in Kenya, and after leaving school went to London, where she married Denton Evans (who grew up in the Falkland Islands and later lived in Kenya; his father has written an interesting book about the Falkland Islands). After their marriage Denton and Ione went to New Zealand, and all their children were born there. This item from an Alaskan newspaper mentions the James W. Growden award. At the Lathrop Celebration of Excellence awards ceremony Wednesday night, Keegan Severns received the James W. Growden Award, which goes to the top student athlete at the high school. In recent years, former Lathrop basketball coach Joe Tremarello has made the presentation, including a description of Growden’s achievements. Growden was a star Fairbanks athlete in the 1950s who became a coach in Valdez. He died, along with his two sons, in the 1964 earthquake. I believe there is also a Growden Memorial Park in Alaska, presumably also named after him. James Wilson Growden was born in 1935, the youngest son of William Nelson Growden. James was my fourth cousin. I believe that his daughter Ronda survived (it was not the earthquake that killed James and his sons, but they had gone down to the harbour to watch the fishing boats land their catches, and were drowned by the resulting tsnunami). William Nelson Growden was born in Tennessee, and worked in government service in Alaska. He was the son of Arthur Matthew Growden, who was born in Dunedin, New Zealand. Much of this information I got from Monica Louise Deragowski of New Orleans, who was a first cousin of James Wilson Growden, and was very interested in the family history, and corresponded with Growdens all over the world. I’ve been trying to continue her work, and see if I can find links between all the Growden families, so I’m very interested in news items, like the one above, that mention the Growden family history.